Flame-resistant coverall from Bulwark of America - the world's largest FR workwear company. Made from Lightweight 250 GSM Twill 100% Cotton, treated with Pyrovatex to ensure FR for the lifetime of the coverall. Be all round visible: full 360 degree visibility with front and back, thanks to the 2" reflective tape. Two-way concealed, Nomex taped, brass break-away zipper. Available in all sizes and variety of colours. Two set-in front pockets and two patch hip pockets . For Industrial Wash, Home Wash and Light Soil Wash.
Certified to EN 11612 (FR standard) and EN 1149 (AntiStatic standard). If you need your company logo applied by embroidery or heat seal, just contact us adn we can do it, inhouse for a small additional fee. Flame-resistant (FR) and anti static coverall from Bulwark. Made from 350gsm Twill 100% Cotton with Pyrovatex FR treatment - to last the lifetime of the coverall. 360 degree visibility with front and back 2" reflective tape. Two-way concealed, Nomex taped brass break-away zipper. Available in all sizes: 36" to 60" and red, orange, royal and navy blue. 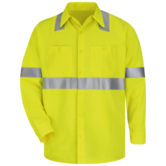 Bulwark of America is the largest FR workwear manufacturer in the World. Arm Yourself! 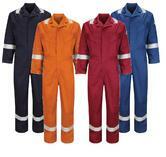 These coveralls are certified to EN11612 and EN 1149 European Norms. Great protection Work Pant from bulwark with flame resistant properties. EXCEL FR® fabric with great freedom of movement. Interlined waistband with two slack style front pockets. 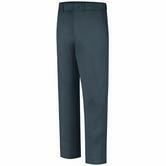 Bulwark trousers comes with two set-in hip pockets and left hip pocket with button closure. PEW2 is suitable for Light Soil Wash and Industrial Wash.
Bulwark FR Sweater with Electric Arc protection. 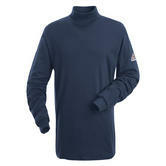 Bulwark Navy TurtleNeck Excel is a long sleeve sweatshirt. 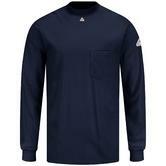 It is made of 6.25oz FR material - EXCEL interlock cotton which is 100% Flame Resistant cotton. The Bulwark flame resistance (FR) cannot be degraded by laundering! It is permanently treated for the life of the garment. Thjis FR Sweater can be used for most areas - involving ferrous metals such as foundries, welding, flame cutting etc. Also used in electrical utilities, oil, gas, petrochemical and chemical industries. 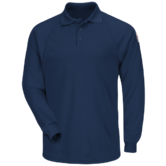 Bulwark FR 100% cotton flame-resistant sweatshirt meets the requirements of NFPA 2112 standard on Flame-Resistant Garments for Protection of Industrial Personnel Against Flash Fire. Contrast mesh side seam gusset. Self-fabric crew neck collar and raglan sleeves. Tagless base layer with Hemmed sleeves. Heat seal Bulwark® triangle centered at neck to show wearer has on FR undergarment. Made from Excel FR® Flame-resistant, 5.5 oz. (185 g/m²) 90% Cotton / 10% Polyester. Fabric with moisture management finish. CAT 1 of Arc Rating ATPV 6.4 calories/cm². #1 Bulwark is the World’s Largest Manufacturer of FR clothing. Yes – Bulwark makes more flame retardant clothing and anti flame workwear than any other supplier in the world! Consider the Bulwark CAD6 coverall. This is a Deluxe 350gsm FR coverall, that is EN 11612 (FR) and also EN 1149 (antistatic) certified, as well as being triple stitched and a nice sateen weave cotton finish. 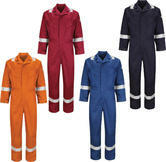 or the Bulwark Lighweight CAD4 an anti static 250gm FR coverall in red or orange or navy. Traceability: If there is a problem with your current FR coverall - can you trace back to see who caused it? and where the issue arose? . Bulwark tracks every stitch of every garment across 60 manufacturing points. Bulwark is the only brand of FR garments to track every stitch of every garment across 60 manufacturing touch points. That gives you real confidence. Product Knowledge: Bulwark University is run to research and educate Bulwark staff & customers as to the real risks relating to fire and electricity. Bulwark product development designs garments to overcome the health risks. Bulwark Arms you with the product and the knowledge to protect you against skin burns. Highest standards: The Bulwark byline of “No Compromise” is evident in product design & quality. Arm Yourself today with the premium design quality of Bulwark FR coveralls.